Jay Newton-Small - Columbia University Club of Washington, D.C. In anticipation of the likely election of the first female president of the United States, Jay Newton-Small will speak about her recent book, about her conversations with Hillary Clinton, and about how she would govern differently from a male president. Appetizers are included. There will be a cash bar. There will also be a limited number of books available for sale& signing! 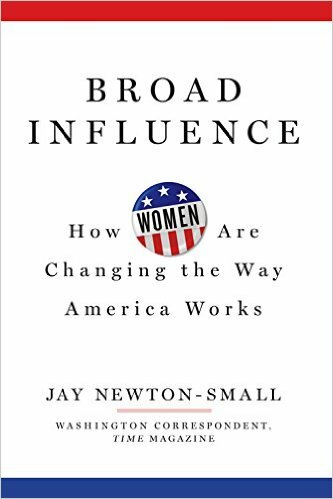 'Broad Influence: How Women Are Changing the Way America Works' is a powerful and insightful look at how women are transforming government, politics and the workforce and how they are using that shifting dynamic to effect change throughout America. Newton-Small, one of the nation’s most respected and experienced Washington journalists, takes readers through the hallways of Capitol Hill, inside corporate boardrooms and police departments, onboard U.S. Navy ships and behind Hollywood’s cameras—wherever women are changing the way how America works. Newton-Small offers deep, exclusive reporting and over 200 interviews, including conversations with Hillary Clinton, Nancy Pelosi, Janet Napolitano, Barbara Mikulski, Kirsten Gillibrand, Valerie Jarrett, Sarah Palin, Kelly Ayotte, Cathy McMorris Rodgers and dozens of other former and current senators, representatives, senior White House staffers, CEOs, generals, admirals, film producers and police chiefs. Drawing on Newton-Small’s 18 years as a journalist (nine at TIME), covering four presidential campaigns and numerous world events, Broad Influence presents an unprecedented examination into how women are changing the political, economic and social landscapes. JAY NEWTON-SMALL is a political correspondent for TIME, covering Congress, politics and foreign policy. She has focused extensively on women's role in Washington, as evidenced by her two Sarah Palin cover stories, magazine profiles of Nancy Pelosi, Valerie Jarrett, Michelle Obama, and, of course, the October 2013 story that started it all, “Women Are the Only Adults Left in Washington,” about the 20 women senators who broke the logjam to get the government restarted and avoid default. She covered Hillary Clinton's 2008 campaign and her tenure at the State Department. She has interviewed almost every female member of Congress; and most living past and present female cabinet members and governors. Newton-Small received her M.S. in journalism from Columbia University and a B.S. in International Relations and a B.S. in Art History from Tufts University. The daughter of two United Nations diplomats, she grew up abroad, living in such places as Asia, Africa and Europe. She is fluent in French.